Nebuchadnezzar I[nb 1] (/ˌnɛbjʊkədˈnɛzər/), r. c. 1125–1104 BC, was the fourth king of the Second Dynasty of Isin and Fourth Dynasty of Babylon. He ruled for 22 years according to the Babylonian King List C,[i 2] and was the most prominent monarch of this dynasty. He is best known for his victory over Elam and the recovery of the cultic idol of Marduk. He is unrelated to his later namesake, Nabû-kudurrī-uṣur II, who has come to be known by the Hebrew form of his name “Nebuchadnezzar.” Consequently, it is anachronistic but not inappropriate to apply this designation retroactively to the earlier king, as he does not make an appearance in the Bible. He is misidentified in the Chronicle Concerning the Reign of Šamaš-šuma-ukin[i 4] as the brother of Širikti-šuqamuna probably in place of Ninurta-kudurrῑ-uṣur I. He succeeded his father, Ninurta-nādin-šumi, and was succeeded in turn by his son Enlil-nādin-apli, brother Marduk-nādin-aḫḫē and then nephew Marduk-šāpik-zēri, the only members of this family known to have reigned during the dynasty. At that time, in the reign of a previous king, conditions changed. Good departed and evil was regular,[nb 2] The lord became angry and got furious. He gave the command and the gods of the land abandoned it […] its people were incited to commit crime. The guardians of peace became furious, and went up to the dome of heaven, the spirit of justice stood aside. …who guards living beings, prostrated the people, they all became like those who have no god. Evil demons filled the land, the namtar-demon […] they penetrated the cult centers. The land diminished, its fortunes changed. The wicked Elamite, who did not hold (the land’s) treasures in esteem, […] his battle, his attack was swift. He devastated the habitations, he made them into a ruin, he carried off the gods, he ruined the shrines. —The seed of kingship, lines 15-24.
the axes (held in the hand) burned like fire and the road-surfaces were scorching like flame. There was no water in the wells and drinking supplies were unavailable. The strength of the powerful horses slackened and the legs of even the strongest man weakened. According to the kudduru, Nebuchadnezzar routed the Elamite king Ḫulteludiš-Inšušinak on the banks of the river Ulaya in an engagement that saw the dust of the battle darkening the sky. 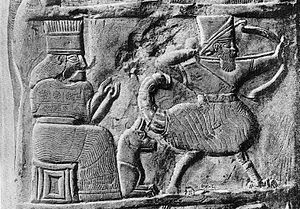 No contemporary or later source records a sack of Susa by Nebuchadnezzar, but according to another kudurru he was able to retrieve the statue of Marduk (here called Bēl) and that of the goddess Il-āliya (DINGIR.URU-ia) during this or another campaign. [i 6] The campaign destroyed Elam as a power and provided a defining moment for the Babylonians akin to the siege of Troy for the ancient Greeks. The Hymn to Marduk,[i 9] celebrating victory over the Elamites, is assigned to him rather than Ashurbanipal who had a similar triumph, on stylistic grounds. There is a poetic pseudo-autobiography,[i 10] which does not actually mention him by name. An interlinear Sumero-Akkadian text[i 11] describes the events preceding the return of the statue from Elam and its joyous installation in Babylon. A seventh-century astrological report alludes to observations made during his reign and their relationship to his devastation of Elam. The Synchronistic History[i 12] relates his entente cordiale with his contemporary, the Assyrian king Aššur-rēša-iši I,[i 13] and subsequently the outcome of two military campaigns against the border fortresses of Zanqi and Idi that he conducted in violation of this agreement. The first was curtailed by the arrival of Aššur-rēša-iši’s main force, causing Nabû-kudurrī-uṣur to burn his siege engines and flee, while the second resulted in a battle in which the Assyrians apparently triumphed, “slaughtered his troops (and) carried off his camp.” It even reports the capture of the Babylonian field marshal, Karaštu. He is titled as the conqueror of the Amorite lands,[nb 3] “despoiler of the Kassites,” in the Šittti-Marduk kudurru, despite the beneficiary being a Kassite chieftain and ally, and having smitten the mighty Lullubû with weapons. His construction activities are memorialized in building inscriptions of the Ekituš-ḫegal-tila, temple of Adad, in Babylon, on bricks from the temple of Enlil in Nippur and appear in the later king Simbar-Šipak’s reference to his having built the throne of Enlil for the Ekur-igigal in Nippur. A late Babylonian inventory lists his donations of gold vessels in Ur and Nabonidus, ca. 555 to 539 BC, consulted his stele for the ēntu-priestess. The earliest of three extant economic texts is dated to his eighth year. Together with three kudurrus and a stone memorial tablet, these are the only contemporary commercial or administrative records extant. Apart from the two deeds related to the Elamite campaign, the other kudurru[i 14] bears witness to a land grant to the nišakku of Nippur, a certain Nudku-ibni. His name appears on four Lorestān bronze daggers and there is a prayer to Marduk on two more. He may be the Nabû-kudurrī-uṣur who is mentioned in the Chronicle of Market Prices[i 15] which records his ninth year but the context is lost. The Uruk List of Sages and Scholars[i 16] names Šaggil-kīnam-ubbib as the ummânu, or sage, who served under him and the later king Adad-apla-iddina when he would author the Babylonian Theodicy, and several literary texts are thought to originate from his age, written in both Sumerian and Akkadian. Lambert has suggested that it was during his reign that Marduk was elevated to the head of the pantheon, displacing Enlil and that the Enûma Eliš was possibly composed, but some historians claim an origin during the earlier Kassite dynasty. A text concerning chemical process (imitations for precious stones) bears a colophon identifying it as a copy of an older Babylonian original but places it in his library. ↑ A. K. Grayson (1975). Assyrian and Babylonian chronicles. J. J. Augustin. p. 231. ↑ P. Pitkanen (2004). Central Sanctuary and Centralization of Worship in Ancient Israel. Gorgias Press. p. 34. ↑ Nielsen, John (2012). "Nebuchadnezzar I's Eastern Front". The Ancient Near East in the 12th-10th Centuries BCE: Culture and History, AOAT. 392: 401–411. ↑ D. J. Wiseman (1975). "XXXI: Assyria and Babylonia, c. 1200-1000 BC". In I. E. S. Edwards. Cambridge Ancient History, Volume 2, Part 2, History of the Middle East and the Aegean Region, c. 1380-1000 BC. Cambridge University Press. pp. 454–457. ↑ Benjamin R. Foster (2009). "Akkadian Literature". In Carl S. Ehrlich. From an antique land: an introduction to ancient Near Eastern literature. Rowman and Littlefield. p. 200. ↑ J. J. M. Roberts (2002). The Bible and the Ancient Near East: Collected Essays. Eisenbrauns. pp. 83–92. ↑ A. K. Grayson (1972). Assyrian Royal Inscriptions, Volume 1. Otto Harrassowitz. pp. 147–153. ↑ 8.0 8.1 J. A. Brinkman (2001). "Nebukadnezar I". In Erich Ebeling; Bruno Meissner; Dietz Otto Edzard. Reallexikon der Assyriologie und Vorderasiatischen Archäologie: Nab – Nuzi. Walter De Gruyter Inc. pp. 192–194. ↑ William John Hinke (1907). A New Boundary Stone of Nebuchadrezzar I. University of Pennsylvania. pp. 142–155.